Through the Canadian Beef Cattle Check-Off, producers collectively invest in research, market development and promotion to achieve the industry’s long term vision of a dynamic and profitable Canadian industry with Canadian high quality beef products recognized as the most outstanding by Canadian and world customers. Both national and provincial groups across the country have been working hard on the National Beef Strategy to show the benefits that the industry could see from an increased check-off. Most provinces will have begun collecting an increased check-off of $2.50 (up from $1) sometime in 2018. To attain national treatment, and collect the equivalent amount on imported beef, the country needs to show a national collection of the $2.50. We’re dedicating this issue to showcasing the value of the increased Canadian Beef Cattle Check-Off, and how it will positively impact the Canadian beef industry. In this issue, you will find a piece from each of the check-off program providers, the Beef Cattle Research Council, Canada Beef and Issues Management, discussing the value of the increased check-off to their specific programming and the results that producers can expect. You’ll also find graphics snipped from our 2016-17 Annual Report showcasing some of the results of programming administered last year. The National Beef Strategy is about setting the Canadian beef industry up to be more profitable, to grow, and to continue to produce some of the world’s finest beef. 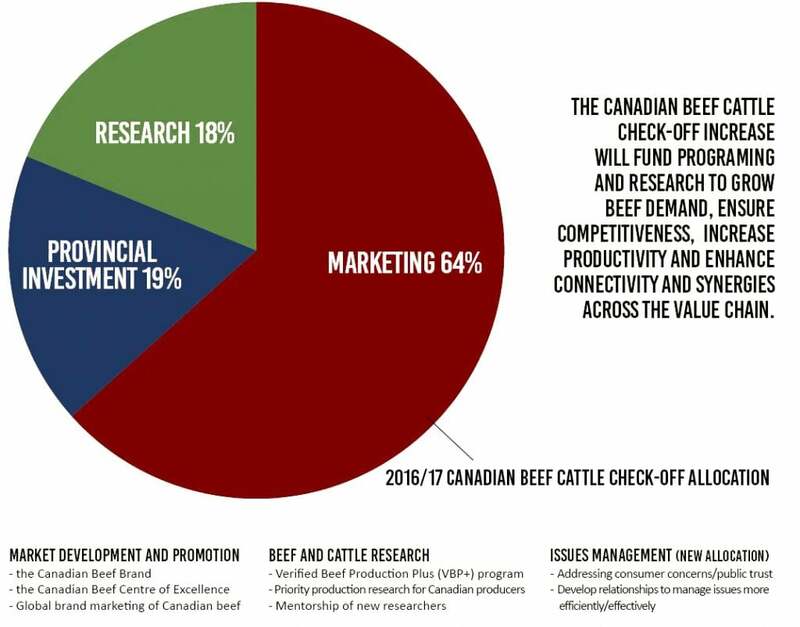 The Beef Cattle Research Council (BCRC), funded by the research allocation of the Canadian Beef Cattle Check-Off, works on all the Strategy’s pillars – Productivity, Beef Demand, Connectivity and Competitiveness. The Canadian Beef Cattle Check-Off is scheduled to increase from $1.00 to $2.50/head in most provinces in the spring of 2018. Each province decides how much of the check-off is spent on research and marketing but it is recommended that $0.75 be allocated to research to maintain and enhance research investments that have the greatest potential to advance the industry. These research priorities will continue to focus on 1) improving competitiveness in the production of beef cattle, 2) supporting science-based policy, regulation and trade, 3) supporting science-based public education and advocacy, 4) supporting the Canadian Beef Advantage, and 5) accelerating the adoption of beneficial innovations by the Canadian beef industry. Existing funding is too low to support all the research our industry needs. In fact, research will be cut back even more without an increase in producer funding. Greater industry investment is also needed to make sure that governments also continue to support beef research. Government funding and resources are limited unless industry invests too, meaning that if we don’t invest, they won’t either. Strategic investment in research capacity in priority areas Some research outcomes identified under the National Beef Strategy cannot be achieved at current funding levels. There simply aren’t enough industry research dollars available to support all the research projects, positions, and facilities that we need. The increased Canadian Beef Cattle Check-Off will build research capacity and program funding in areas that have been on the decline in Canada. As one example, Canada’s beef industry relies on productive, high quality forage. But Canada’s forage researchers have been retiring faster than new ones have been hired. Forage research and extension can make significant improvements in forage yields, productivity and cattle performance, as well as the environmental sustainability of Canada’s beef industry. The increased Canadian Beef Cattle Check-off will ensure that new producer-focused forage breeders, agronomists and grazing researchers are trained and hired in Canada. Governments have been reducing their involvement in animal health and disease surveillance and monitoring activities for many years. Surveillance is critically important, and industry needs to take a greater role in it. Maintaining and building better surveillance networks for production limiting diseases, animal health, and antimicrobial resistance is critical for our industry to demonstrate the integrity of the Canadian beef supply chain to consumers, food companies and global trading partners. Surveillance allows us to validate our animal health and welfare practices, as well as overall efficiency (which has environmental benefits). Surveillance is also critical to identify areas where research and/or changes in production practices can help us raise cattle better and more profitably. Sometimes it’s simpler to adopt practices that already work for other producers. A domestic and international research liaison will look for practices and technologies from across Canada and around the world that have the potential to benefit more producers here and find ways to modify them so Canadian producers can use them on their own operations. Technology transfer and extension to industry is essential to get research results, knowledge, improved practices, and technology from scientific publications into the hands of producers. We will develop more economic decision-making tools and resources to help producers weigh the costs and benefits of adopting new technologies or management practices. The delivery of extension initiatives through national and/or regional producer networks will also be supported to encourage broader and more rapid uptake of new technologies. In addition to funding research, the BCRC is responsible for the delivery of the Verified Beef Production Plus (VBP+) program, which verifies on-farm practices related to food safety, animal care, biosecurity, and environment. Ongoing national industry investment will ensure the consistent delivery of the VBP+ program as it becomes a core pillar in verifying sustainable beef production in partnership with end-users. The National Beef Strategy is about positioning the Canadian beef industry for greater profitability, growth and continued production of a high-quality beef product of choice in the world. It is under the Demand Pillar of the National Beef strategy where Canada Beef operates, and brings value to producers. The Canadian Beef Cattle Check-Off is scheduled to increase to $2.50/head in most provinces in the spring of 2018, and Canada Beef wanted to highlight how the recommended allocation to Canada Beef will be put to use strengthening existing programs and building strong demand into the future. Canada Beef will be able to move the Canadian Beef brand to the next level. Using market segmentation tools, we will identify high growth, high value consumer groupings by demographics, behavior, ethnicity, geography. By understanding consumer segments’ needs and wants, we will develop marketing and promotional campaigns relevant to each segment resulting in increased awareness, improved perception, heightened desire and ultimately increased purchase. Canada Beef will be able to intensify and increase consumer–directed programs through partnerships with both retail and food service chains. This allows for brand exposure with both regional and national reach. Moreover, these programs build loyalty and commitment to Canadian beef among trade partners and consumers thus generating sustained demand and increased value for producers. With heightened competition from other beef exporters, there is a need to intensify our brand and business development programs in export markets where we are currently present. These include Mexico, Japan, China, SE Asia, Korea, Taiwan, EU and MENA. Likewise, growth opportunities can be addressed within these markets in both the retail and foodservice sectors. Emerging markets will also be identified and explored with the goal of being first to market. With the increased check-off investment, we envision the Centre of Excellence will double the business generated for Canadian partners over the next five years. To date, the Centre has hosted missions representing over 460 companies globally, helping generate an estimated $380 Million in new Canadian Beef business. There will be heightened focus on innovation and closer tie-in with packers, retail, and foodservice partners. For more information about Canada Beef visit www.canadabeef.ca/ and sign up for The League Newsletter which is designed to keep producers informed about current initiatives. The purpose of the National Beef Strategy is to position the Canadian beef industry for greater profitability, growth and continued production of a high-quality beef product of choice in the world. Demand for high quality protein is expected to continue to grow in most developing nations. The majority of market access once impacted by BSE is now normalized, and significant new trade agreements are coming into effect, providing new opportunities for Canada’s beef industry to seize upon. The National Check-off is scheduled to increase to $2.50/head in most provinces in the spring of 2018 to support the National Beef Strategy. To develop stronger relationships and connectivity among industry partners and organizations to manage issues more efficiently and effectively. By increasing internal industry communication and creating a forum to easily share consumer issue response information among industry groups, we will be more efficient when answering consumer questions or addressing negative stories in the media. The newly created “Issue Response Team” will help develop issue specific response plans to be proactive in addressing issues with appropriate lead and support organizations as per the issue at hand. This will not only reduce duplication of efforts and resources when embarking on public communications but will also create stronger cohesion among industry groups. Increased effort will be placed on increasing internal collaborations, and with other agricultural partners, stakeholders, media, and academia. Credible, authentic spokespeople who can communicate effectively are essential in building relationships with our consumers and the public. Training industry staff and producers in traditional and social media communications and other areas will enable industry to reconnect with consumers on a personal, transparent, and authentic level. This training will also involve enhancement of the Beef Advocacy Canada program to include new training modules and the key message information repository (mentioned below). Other organizations and industry experts will be able to amplify our messages and provide objective comment on production practices, which will provide a valid “second opinion” for the public to hear and trust. Organizations like Ag in the Classroom and the Canadian Roundtable for Sustainable Beef can help in telling our story to build trust with the public. This will also involve supporting public engagement initiatives such as public forum participation, building consumer communication tools with partners and other public communication initiatives. Having information and communication materials (written fact sheets, research, print marketing materials, videos, etc) as well as potential spokespeople contact information (producer, staff, government, academic, other) in a central place online for our industry organizations to access easily will be essential in sharing information among our industry groups, as well as providing timely response material when needed. In addition, we will work with industry partners to develop webpages dedicated to answering consumer and public questions about beef production as part of existing industry websites like Beef Advocacy Canada and Canada Beef. This will help us understand our consumers and how we can better communicate with them to build trust in our product. It will guide developing new ways of communicating as well as prioritize methods of communication that have the greatest impact in creating positive consumer perceptions of our industry. This will also include tracking changes in public perceptions to see if or where we are having an impact. A small percentage of the Issues Management budget will be saved for major issue or crisis management, when extra resources are needed. The National Beef Strategy aims to achieve targeted industry goals identified as being crucial to long-term competitiveness of the industry and all its stakeholders including grass roots producers. These goals include increasing the carcass cutout value by 15% by 2020, reducing cost disadvantages compared to main competitors by 7% by 2020 and increasing production efficiency by 15% by 2020. Establishing concrete goals ensures the results are measurable and in turn demonstrates the value of investments in programs and research. Another goal is a social piece to enhance synergies within industry and connect positively with publics including consumers, government and partner industries. Government routinely encourages industry to speak with one voice as it enables them to meet their mandates, with results to industry visible in the form of trade and market access developments as well as funding agreements. Learn more about the National Beef Strategy at www.beefstrategy.com.